If there is one word that is apt for this generation, it would have to be ‘misunderstood’. When it comes to Millennials, demographers, marketers, HR practitioners and social psychologists concur on two things: the definition of the term (the generation born between 1980 and 2000) and the fact that by 2020, they are expected to constitute more than 50% of the global workforce (Source: PwC Annual Report, 2016). However, from this point on perspectives diverge significantly. And yet... Aurora’s research survey (an informal questionnaire administered to 200 Millennials across Karachi, Lahore and Islamabad), interviews and focus groups with Millennials (the ones already on-the-job as well as those who will be entering the workforce in the next few years) presented a completely different picture. In fact, given the responses, if there is one word that is apt for this generation, it would have to be ‘misunderstood’. The one behavioural trait most commonly attributed to Millennials is that they are ‘serial switchers’. Managers lament the lack of loyalty in this generation and believe that Millennials switch simply because they get bored. Kazi’s opinion is validated by the Millennials working for him during a focus group conducted at Ishtehari. Participants from creative, strategy and account management were unanimous in their view that the reason they have stayed with a start-up agency is mentorship. Anum Mushtaq, Strategic Planner, Ishtehari, shared her journey from working in the hospitality industry and the shift to the world of advertising. Despite having a stable job, she chose to leave because her newly appointed supervisor failed to provide any constructive criticism and made a habit of belittling her work. For her, that was a deal-breaker. Mushtaq is hardly a minority among Millennials in prioritising respect and mentorship over the compensation package. Saria Iqbal, Creative Manager, IAL Saatchi & Saatchi, emphatically declared that just because Millennials are young does not mean “we need to be put in our place during client and project meetings”. Her colleague, Maha Hussain seconded this view, adding that if there are mentors who are actually interested in helping Millennials hone their skills, even a higher salary at an MNC would not lure her away. It therefore seems to be an inaccurate assessment that it is boredom which sets a Millennial off on a job search. In reality, it is the feeling that they have hit a career plateau and are not valued as members of a team which erodes their loyalty. It is fair to say, though, that Millennials tend to hit that plateau a lot sooner than the older generation; once they do, they have no inhibitions – or sense of loyalty (as managers like to point out) – about jumping ship. A Millennial serving his notice period at a digital agency confessed that what convinced him to look for alternative opportunities was the fact that he was doing the same mundane, repetitive work day in and day out, and had no decision-making authority. One of the findings of the PwC Report was that employers view Millennials as digital natives, i.e. people who have grown up with social media and smart devices and hence are unable to ever completely switch-off. When the results of Aurora’s survey were analysed however, it revealed that approximately 80% of the respondents consider work-life balance essential to their creativity and productivity. “We might have smartphones and tablets, but we do not always want to be in work-mode”, says Tahniah Manzar, Senior Creative Manager, IAL Saatchi & Saatchi. Millennials believe that the fact that they are more tech-savvy than previous generations has become their Achilles heel. This is particularly true for those working in digital agencies and technology start-ups where the concept of working nine to five is non-existent. The excitement of being given Notebook computers and iPhones soon fizzles out when there is an unrelenting pressure to respond to work emails after hours and constantly monitor the social media pages they manage. According to Leon Menezes, professor-of-practice, IBA-Karachi, “my students are acutely conscious of falling prey to burnout; they stay up all night to study for exams or prepare project presentations, but only when the semester is about to conclude. They do not consider making it a practice, because, as they tell me ‘it stifles our drive, creativity, and excitement’”. Kazi points out that this does not mean that Millennials will walk out the door, right on the clock, if a project deadline is near. In fact, if given the autonomy to manage projects, Millennials pull all-nighters, skip social and even family functions (without being asked) to fulfil their responsibilities. So while work-life balance is among the top three motivators for Millennials, they are more than willing to work long hours for bosses and organisations they feel loyal towards, even if they are not monetarily compensated for it. When it comes to the Millennials’ Employee Value Proposition – the set of characteristics, benefits and appeal of working for an organisation – there is a prevalent assumption that it is money alone that Millennials give the most weightage to in a job offer. Given the era of consumerism that this generation was born into, money is obviously an important factor because it allows them to “travel, explore new places, buy branded goodies and the latest gadgets that are out there.” However, increments alone do not work as a retention strategy because Millennials are not just looking for a nine to five ‘job’, but rather view their work as an extension of their personality. Approximately 56% of the Millennials surveyed identified career progression and opportunities for personal development as the most influential factor in staying with the same organisation. Four and a half years later Kazi considers it the most risky, yet most rewarding, decision he made. “I discovered that advertising careers have an exponential learning curve, but it tapers out when you become disillusioned or jaded, which is when new agencies are born.” Initially, the lack of capital forced the two-member organisation to work out of coffee shops until they acquired enough accounts to set up an office. As excited as he is about going up against the bigger agencies in pitch meetings and winning new accounts (John Hopkins is the latest addition to Ishtehari’s portfolio), he is even more proud of the fact that his team loves coming to work and have been with him for years. Menezes is of the view that the clichéd generational gap is more a ‘gap of understanding’. Gen X and Y individuals fail to comprehend why someone would quit an average-paying, yet secure, job and set up their own business where the risk of failure is considerably high. Having taught Millennials for the last four years, he is of the opinion that job and career changes do not intimidate Millennials if it gives them a chance to explore new avenues and discover their own hidden talents. As a Millennial myself, what I can say is that our generation does not want to be micro-managed or boxed in by rigid corporate structures and archaic policies. We are driven by ambition and a desire to evolve; mentorship and a pat on the back engender our loyalty. However, some of us do expect instant gratification, which is perhaps why we are perceived as impatient and entitled. As Menezes point out: “Organisations that provide learning experiences and growth opportunities will not have a problem in either attracting, or retaining, Millennials. Ayesha Shaikh is Business Development Executive, The Dawn Media Group. Read this edition and the chances are there will not be much left to know about what Pakistani employers think of the Millennial generation, or indeed, how Millennials in this country perceive their role within the workspace. Predictably, there is a degree of divergence in how their aspirations and expectations are viewed, depending on which side of the employer-Millennial divide one finds oneself situated. The Millennial generation is defined as one born between 1980 and 2000; although given the accelerated pace of change in our world today, this is an arbitrary definition, as there is some evidence to suggest that the gaps between successive generations is collapsing into much shorter timeframes. However, what cannot be disputed is the fact that the Millennial generation in 2016 is a young one, making it pertinent to pose the question of whether Millennials are that different from the young of previous generations in terms of their attitude, idealism and ambition? A quick scan back to one’s own youthful days would suggest they are not that much different. Which one of us has not aspired to change the world, indulged in the notion of achieving our wildest dreams, been outraged by the rigidness expressed by our elders and been possessed by the implacable certitude that we knew better? So one may conclude that the young will always behave as the young do. And yet. There is more to the Millennial mindset than just the exuberance, hurry and purposefulness of the young. Millennials, who in the due course of time will become the middle-aged and then the elderly, are different. First of all by virtue of the impact of technology. To make the much-laboured point once more, Millennials are digital natives. They have no conception of a life without the internet or a mobile phone, and instant access to information and entertainment is a given. Technology has made this generation global citizens as their screens instantly transport them to wherever they want to go in the world. Technology has also been the greatest leveller of all time; accessibility has given them the possibility of acquiring infinite amounts of knowledge at the swipe of their screens. As a result, the limitations and barriers that formerly kept human beings grounded in legacies and hierarchies have dissolved. And technology is not only about an online world; travelling to Mars and beyond has become an imminent possibility and soon we will be consulting with our fridges and going to the movies with the robot who cooks our food. It is in this world of limitless possibilities that the Millennial generation was born. In the Millennial mindset, nothing is impossible. Secondly, Millennials were also born into a much less financially-secure world. The certitude of employment has vanished and with it old-fashioned notions that a job is forever and remaining employed is a must – no matter what the cost. As a result, Millennials are improvisers and experimenters (as exemplified by the start-up culture and the gig economy) and they are fearless at it, making them perfect employees and entrepreneurs in a time when change just keeps on happening and business models have to be reengineered again and again. Thirdly, the world which Millennials inhabit is much more collaborative. The complexities inherent in technology militate against a one dimensional combative and competitive approach and the Millennial instinct is to partner, share and associate, even despite the narcissism engendered by social media and best expressed by the much overused phrase that anything and everything they do or see is just ‘amazing’. Fourthly, it is also worth remembering that Millennials are living at a time when the ‘reverse’ learning curve has never been so pronounced. The pace of change and technological advancement is such that unlike previous generations, where the older and more experienced taught the younger, today, even 10-year-olds are teaching their parents or teachers how to manage their devices and gadgets. This is then extended into the workspace in the form of reverse mentoring, whereby younger colleagues are teaching older ones how to navigate the technology space, thereby crossing the long-held lines of experience based hierarchies. How Millennials will reshape the world as they mature is difficult to predict. However, what is certain is that organisations have to adapt to the new rules of engagement and become less hierarchical, much more collaborative and even more flexible and responsive (to both employees and customers). The good news, as this edition shows, is that Pakistani companies are aware of the adaptations they will have to make and some have already started doing so. And truth be told, there are no ifs and buts and choices here. The Millennials have entered the workspace. Really appreciate the views in this article; would like to add though that 'screen time' in office is a huge hindrance to work. It causes distraction, lack of focus and takes away the 'attention-to-detail' which is required from staff at relatively more important areas in the organization. 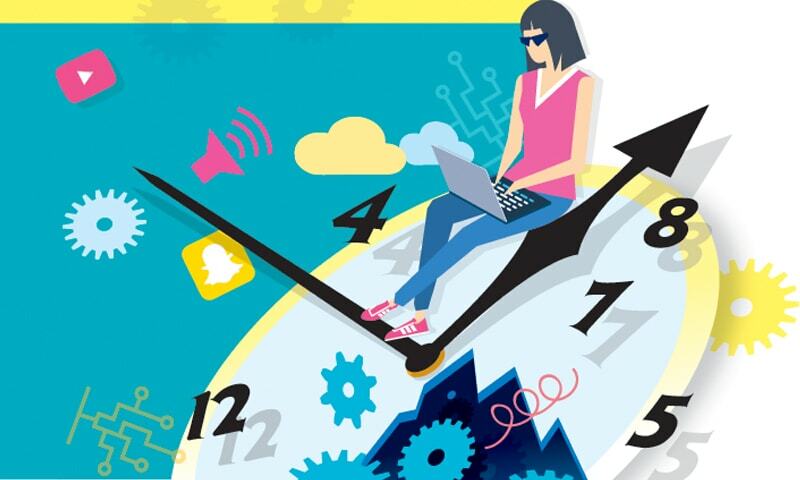 To avoid the srength of millennials as mentioned in this article to become a problem area, workplace policies around allocated 'screen time' could work; so like everyone could have say 15 minutes from noon to 12:15 to check their social media accounts. Nonetheless managing millennials is an enigma we'd only learn by doing often and making mistakes along the way. The best approach i guess is a collaborative one, bring them in, value their ideas, make the most of their strengths but also be firm on where you believe the organization's reputation or ability to deliver is at stake. The Millennial's in USA are underpaid and overworked most of the time. It depends on who is your employer and work schedule is Monday through Friday 8 to 5pm. Employers need to give more family time and better pay to their employees. Job hopping is the only way the precarious skilled worker can encash himself in the capitalist, free market economy. Unless you are going to keep your employer on the edge and leave only once and when you are needed most ..you will not find yourself being valued. If there is no job for life...there is no employee for the month and yes, the youngsters should leave at drop of the hat...to keep the game up. @Proletariat I disagree. There are many ways to ensure your employer, knows your value, and pay increases can be negotiated commensurately. No need to leave, just for financial reasons.